Marketing Your Property Preservation Business: How Can I Get More Business? If you have an established property preservation business, you may still be looking to get more clients or projects. Like any business, this lucrative and reliable business still requires marketing, especially in the first few years. My years of experience in property preservation can help you market your business and acquire more clients in a short period of time. Let’s take a look at the basics of property preservation business marketing, both in the beginning and on an ongoing basis to get you the clients and business you need to stay out of the red and into the green. (Don’t worry, marketing isn’t hard — it just takes a little effort on your part.) Get ready to take notes! While marketing may not be your strong point, know that every business owner everywhere needs to know how to do it. Read on to learn the best and easiest ways to market your property preservation business, and get more business. Teaching clients why they should choose your services over your competitors’ services. Starting with the short checklist in the “What is Marketing” section above, make sure you have the tools you need for a successful business. First, research. How Should I Research My Business Market? 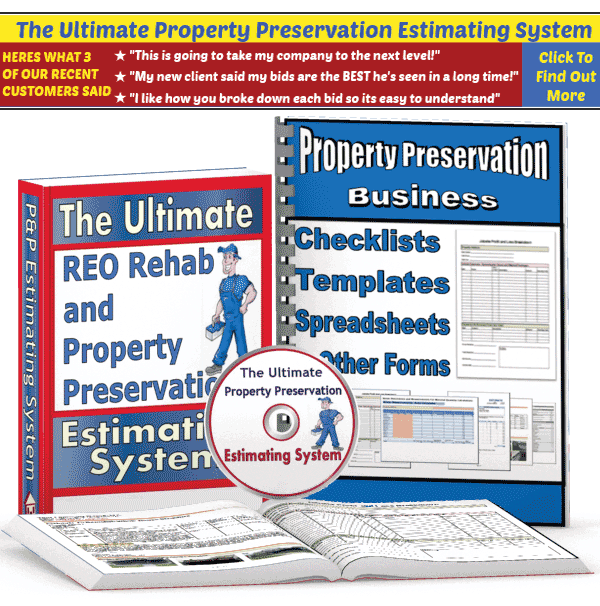 Why do they use property preservation services? Which property preservation businesses are most popular in my area, and why? 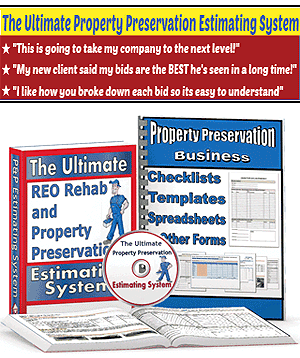 What can you offer clients that other property preservation businesses can’t? Once you have a website, keep it tidy and easy to get around on. No one likes a website that isn’t nice to look at or is hard to find information on. Using a free, predesigned website template from a business like Wix or Squarespace is the best place to start if you can’t afford an expensive website designer or company. These templates are pretty simple to use, even for newbies. Once your website is up and running, create social media accounts for your business on Facebook, LinkedIn, Twitter, and Instagram. Wix makes it easy to link your accounts to your new website. If you can afford it right off the bat, you can advertise cheaply on Facebook through its marketing programs, and you can take out ads in real estate magazines or on websites in your area. Post on your social media accounts at least once a week to keep interest and search engine results high. You can also advertise in person, which means calling real estate organizations in your area, banks, and lenders, and preparing brochures to drop off at banks and lenders you want to work with. Last, always be friendly, helpful, and positive when you are out in your community, and make sure your property preservation business does the best work and goes the extra mile. Word will get around quickly and business will start rolling in. What Should I Do to Keep Marketing My Business? The key to good marketing is not to stop just because you have enough business. You need to keep publishing on social media accounts, and adding new information to your websites. Images of completed jobs you’ve done, or even before and after pictures are a great place to start. Clients want to know about your past work before they hire you, so write up a few descriptions of difficult projects you’ve worked on and the stellar results you had. How Can I Get More Business? Word-of-mouth is important in small and large communities, and every business interaction you have should be positive, with every client receiving great work from your business. Even when you’re having a bad day, try not to let it show. Clients want to know that your business is reliable and efficient, so show them that on your website and through your work. You can always up your advertising budget, go to a few foreclosure auctions, or talk to the banks and lenders in your area if you need more business. Most of all, keep trying! Successful businesses are built over years, not days or weeks — the longer your business is around, the more clients you’ll have and the more you’ll learn. What Other Marketing Advice Do You Have For Me? I hope this information answers your questions on marketing your property preservation business, and how to do that. I want your business to succeed, and that’s why I publish these helpful articles with real industry information for you to follow, and tips on how to create more business. As always, I’ve tried to provide as many resources for information here as I can, but please contact me directly or ask a question on my website if you need more information. Sometimes the best information comes from people like me who have been in the industry for a long time. It’s a great time to be in property preservation, and make a great living in the United States. I hope your business will be as successful as mine now that you have the marketing tools to keep gaining business and clients for years.